Amazon has K’NEX Thrill Rides – Web Weaver Roller Coaster Building Set for $35 (Reg $80) with free shipping. Kids can use the 439 classic K’NEX parts and pieces to build a web weaving coaster! 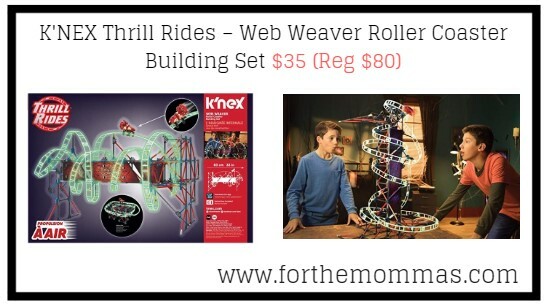 The Web Weaver Roller Coaster Building Set includes an air-propelled, motorized coaster car. Just turn , turn on the Air Propelled, Motorized coaster car for the ultimate Thrill.